38 Bank Street in Galashiels. Councillors have overturned a previous decision to deny planning permission for change of use of a retail unit at 38 Bank Street in Galashiels. 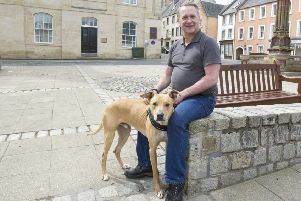 An application to convert the former confectionery shop into a dog-grooming business was rejected as planning officers felt that the site would better contribute to the town centre as a retail space and that insufficient time had been given to marketing it as such. However, numerous social media posts left in response to the Southern’s report in February of the council’s original rejection of the plans were submitted to Monday’s meeting of Scottish Borders Council’s local review body as evidence of support for another dog-grooming salon in the centre of Galashiels. Taking that backing into account, councillors voted to overturn the authority’s original rejection of the plans for the new business, to be called the K9 Grooming Wellbeing Practice, and give it the thumbs-up. The unit had previously been home to a clothes shop and a craft shop as well as a confectioner.